Cinder blocks are generally used to create sturdy bases for construction projects, but with a little creativity, it’s simple to transform one of these durable blocks into an elegant table lamp. Create a unique and stylish aesthetic contrast by adding decorative stenciling to a cinder block for a final product that illuminates and adds a beautiful touch to any room in the home. Quick-setting repair mortar makes for a stable light bulb base that creates a functional and fashionable DIY project. 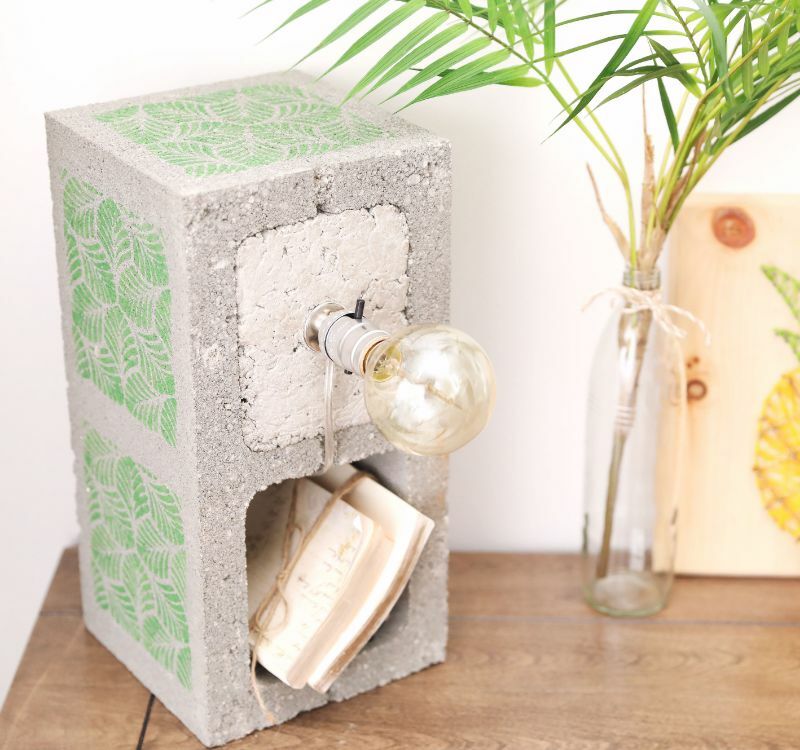 A cinder block lamp is a fun and useful addition to an office desk. Not only does it create a light source, but the secondary cutout also makes a wonderful place to store office supplies or hold mail. Consider setting a cinder block lamp next to indoor greenery to bring out the green paint used in the detailed stenciling. This illuminating accessory provides a quick route to re-purposing a cinder block while also acting as a wonderful conversation starter. -Quikrete repair mortar, 10 oz. 1. Lay a cinder block length-wise on a flat surface so the long surface is facing up and the two cutouts are facing out. 2. Secure a decorative stencil 1 inch from the left edge of the cinder block using painter’s tape on all four sides. 3. Fill a small glass bowl with green paint and paint over the entire surface of the decorative stencil. 4. Move the stencil to the right edge of the cinder block, and repeat the painting process. 5. Tip the cinder block up so it’s standing vertically, and paint a third stenciled design on the top surface of the block. 6. Lie the cinder block down horizontally so the stencil on the top surface faces right, the two stencil designs on the long surface face out and the two cutouts are facing up. 7. Place a folded plastic tarp underneath the right cinder block cutout. 8. Fill a plastic mixing bowl with 10 ounces of Quikrete repair mortar. Wearing plastic gloves will help to avoid the mixture coming in contact with skin. 9. Pour 2 1/2 ounces of water into the mix and stir with a Popsicle stick. 10. Pour the mortar into the cinder block cutout that has the plastic tarp below. Add two additional bowls of mortar before allowing it to set. 11. Remove the plastic tarp, and turn the cinder block over so the drying mortar is facing up. 12. 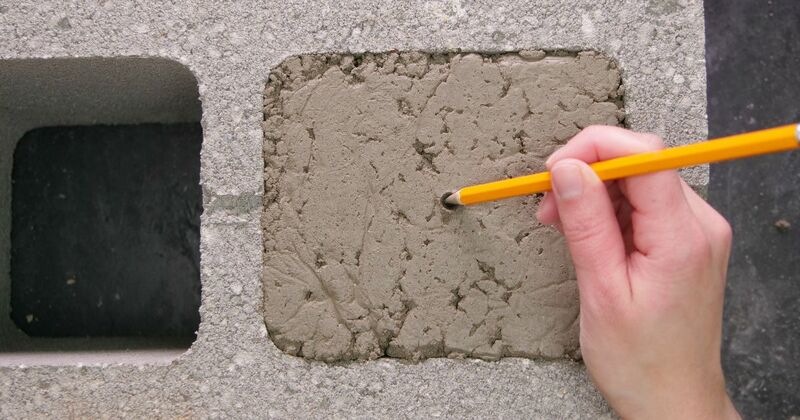 Dig out a hole in the center of the mortar while the surface is still moist using a pencil. The hole should be approximately the size of a half-dollar. 13. Fit a light bulb electrical base into the hole to secure. Allow the cord to extend down the front of the cinder block, and run out the back through the second cutout for easier outlet access. 14. Stand the cinder block up vertically so the electrical base is facing the front and the stencils are visible on the left-hand side. 15. Twist a light bulb into the base and set the lamp on a desk or end table. Use the second block cutout for storage, and admire the illuminated view once the lamp is plugged in!